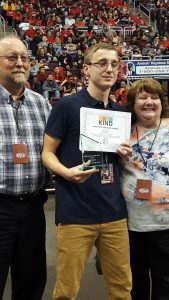 Josh Long, a senior at Fairfield Area High School, was honored with the 2017 KIND Snack Foods PIAA Sportsmanship Award during halftime of the PIAA Class 6A Boys Basketball Championship game at Giant Center on Saturday, March 25. Josh was selected from among several athletes nominated for the award, which honors two PIAA student-athletes who have displayed outstanding sportsmanship. 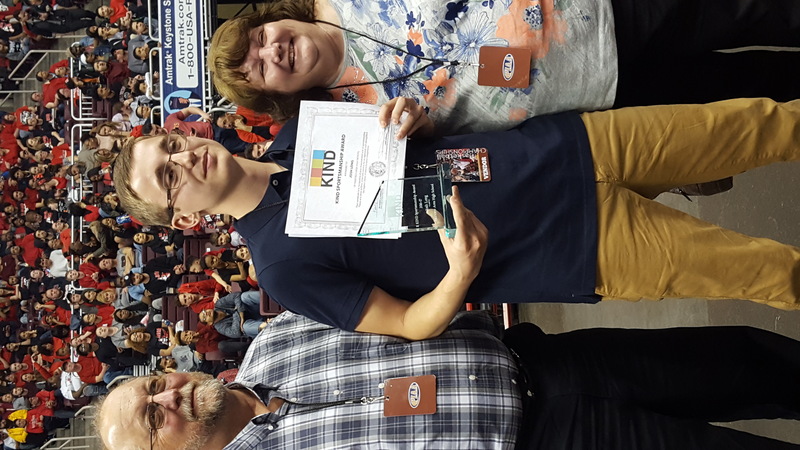 To read the details of Josh’s extraordinary acts of kindness and sportsmanship with fellow cross-country runner and cancer patient Tommy Laudani of Delone Catholic, please click here. This page was prompted by sportsmanship and class shown by Halifax wrestler Joey Kaufman, Class of 2013, who, following his 2012-2013 District 3 Class AA 220-pound wrestling championship, presented his gold medal to fellow wrestler and rival Gus Bostdorf of Camp Hill. Bostdorff missed the 2012-2013 postseason wrestling tournaments because of a medical condition; Kaufman presented his medal to Bostdorf as show of respect. You can read the full story by clicking on the link below. As a result of Kaufman’s gesture, District 3 has decided to dedicate a page to examples of sportsmanship shown by District 3 athletes. Sportsmaship, not wins and losses, is the cornerstone of interscholastic athletic competition, and District 3 believes it should actively promote sportsmanship and the other positive aspects of interscholastic competition to all involved in high school sports. This page will help to serve that goal. Verifiable stories of outstanding acts of sportsmanship can be submitted to District 3 webmaster Rod Frisco at tripletdad1@comcast.net. Once confirmed, District 3 will post them on the website to provide a public record of the great acts of sportsmanship practiced by our athletes. These stories serve as an example to future athletes and a reminder to current athletes that sportsmanship is our highest ideal.